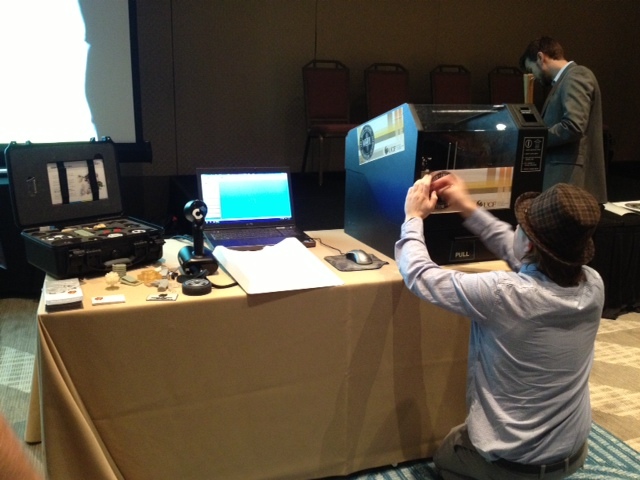 That’s a 3D printer from the University of Central Florida’s Institute for Simulation and Training METIL Lab. David Metcalf and two of his students brought it to the digitalNow conference for The Maker Society, a session they presented with Jenny Levine, Strategy Guide at the American Library Association. Jenny made it clear up front: “Your association does not need a 3D printer.” Instead she focused on the maker culture and what it means for associations. Sounds like the ideal association leader to me. A generation of makers is coming of age — our future members. How do we become organizations they want (and need) in their lives? Librarians, as usual, are ahead of the game. At work, they’re creating maker spaces for kids and adults. At their association, the American Library Association (ALA), they’re experimenting with new approaches to membership issues. Like many associations, ALA has seen a decline in volunteerism. Fewer members are willing to commit to time-intensive volunteer roles. So what can an association do? Jenny appeals to the maker in her members. Listen to member conversations. What are they talking about? What inspires their passion? Jenny monitors an unofficial group of 3000 members and non-members on Facebook – the ALA Think Tank. She looks for short-term project ideas that she can help facilitate. Create new pathways to bring members into association involvement. In addition to the traditional, time-intensive style of volunteer service, offer project-based entry points that require less of a time commitment. Nurture the maker ethos – “let’s just do it” – by providing support or, at least, encouragement to member-organized projects. One of the UCF students mentioned how fun it is to get a maker community going. The community was already there, UCF only needed to give it resources and get out of the way. You have communities of members who are passionate about different issues or causes. Find them and listen to them. What types of projects would give them a sense of satisfaction while also staying aligned with the association’s mission? When Jenny looks for projects, one of her criteria is purpose. David Metcalf looks for passion about a social mission. The motivation behind these projects is a yearning to create or accomplish something. That’s such a powerful desire – the drive to create – yet how often do associations satisfy it? After the session, I wondered: What will happen to the traditional association governance model? Is the next generation of members willing to put in time serving on committee after committee in hopes of getting a board position and then, maybe one day, being nominated for an officer position? Is that a desirable path? Is that how they want to serve? Is that how they envision an association experience? Will this generation of makers be willing to deal with the slow-moving engines of association governance? Does “let’s just do it” work in the association world? Can we find ways to let people get together and make “things” that help their fellow members, attendees, profession/industry or community? Why wait for the young ones to start hacking our associations. Let’s figure out how to just do it ourselves. One thought I’ve had since this session and digitalNow in general: If you were charged with building an organization to beat your current organization, how would you do it? Why not take that approach but from within to strengthen rather than wait for defeat from an outside disruptor? Jay, that’s exactly what I try to do! IDEO is known for helping companies evolve products/services to the point where their competitors would have beaten them, and that’s how I feel about both librarianship and ALA.
A few years ago my partner and I wanted to hold a participatory conference called “Put libraries out of business” by figuring out how libraries could adapt and become the “next thing.” Unfortunately, we still haven’t found a way (or realistically, the time) to pull off that one. Thanks for the great post, Deirdre! Exactly, Jay! Hack your own culture, no need to wait, everyone is creative, they just need to give each other permission to look at things with new perspectives, experiment, fail, learn and try again. Easier said than done, I know, but that cultural shift will be so powerful, it’s worth the initial discomfort. Ooh, Jenny, what a cool project that would be, but, yeah, you’d probably need a paid sabbatical to make that come to life. Thank you both for sharing this post!